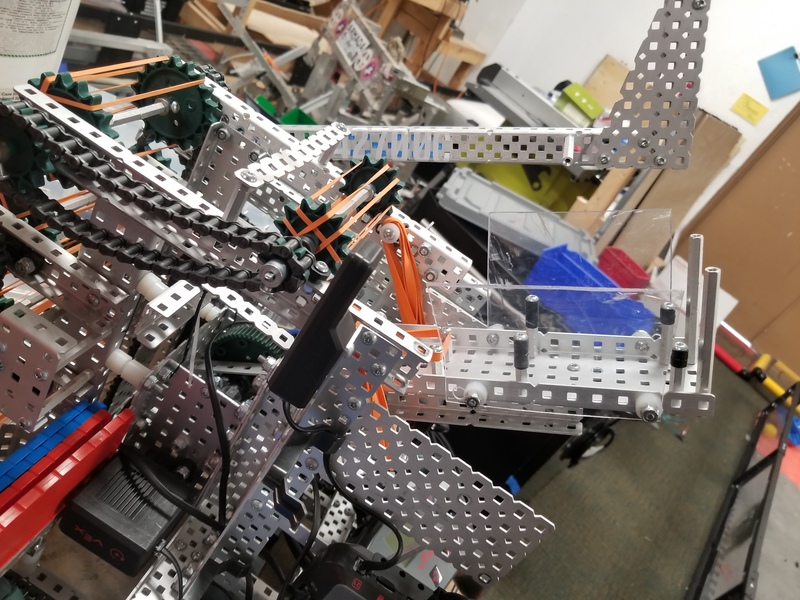 Sneak peak of my robot for US OPEN. I hope I will be able to compete with (I wouldn’t want to be against) you! How well do the mecanum wheels climb? Now that I see your cap scorer, I’ll have to build a descorer. I’ll have to build a descorer. Please don’t lol. Troll bars are SO annoying to play against. One of the failings of his game IMO. I wouldn’t worry about competing against me I’m a pretty trash driver. The mecanum wheels climb the platforms fine. My cap lift can only descore/score on the low posts. Why did you use the tank treads on the sprockets of your intake? I’d guess it is to allow them to get onto the platform easier, and it might also help to keep the rubber bands in the appropriate tooth. I have to. I need to redeem myself. I’m going to do one like 9922Z, one of the teams attending U.S. Open. I believe that no strategy or manipulator should be banned. It’s part of the learning and innovation in vex. From a fairness standpoint I believe that using a descorer is fair because caps are always going to be bad. They’re worth less than flags, take longer to score, and are easily descorable. This is fair in my mind because just last year was ITZ, where lifts and compliant intakes were common. There were many teams in my region who flipped their intakes sideways and re-used their lifts to great success. I’m going to do one like 9922Z, one of the teams attending U.S. Open. I believe that no strategy or manipulator should be banned. It’s part of the learning and innovation in vex. From a fairness standpoint I believe that using a descorer is fair because caps are always going to be bad. 9922Z and I are from the same place, they are good. I think of my thing more as a cap scorer than a descorer, but I agree caps aren’t really that good. Are we going to see an official reveal on your own thread?